Rupert Shortt, Times Literary Supplement religion editor, formerly with the Tablet, author of Benedict XVI: Commander of the Faith, recently reviewed Tracey Rowland’s useful new book, Benedict XVI: A Guide for the Perplexed. Rowland’s views were mentioned in passing. Shortt used the occasion to present his view on the pope. “It ain’t pretty,” as they say. Shortt begins by telling us that Ratzinger’s memoir, Milestones (1994), left a “sour taste” in his mouth because it did not go into the Jewish or Hitler questions. Never mind that in his 1990 Interview, Salt of the Earth, Ratzinger stated: “There is Christian anti-Semitism in France, in Austria, in Prussia, in all European countries, and thus the ground was fertile. This is, in fact, an occasion for a constant examination of conscience.” No matter how many times he has said it before, a modern German must announce his views on this question before speaking on anything else. 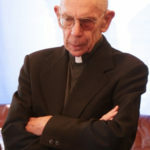 Later on in his review, Shortt tells us, forgetting what Aquinas said about erroneous conscience, that the Second Vatican Council was the first to “acknowledge the sovereignty of conscience.” If one means by “conscience” that we can do or define whatever we want, well, neither Ratzinger, Aquinas, nor the Council held that quaint idea. Ratzinger gave two incisive lectures on conscience, in 1984 and 1991, published as On Conscience. So he is familiar with the topic’s complexity. Shortt acknowledges that the pope is learned, in fact, the first really learned one in centuries. The Church has thus been run by second- and third-rate minds ever since the Apostles, which may be a virtue, not a vice. Benedict, in Shortt’s view, is not really a Grand Inquisitor, a Panzer-kardinal, or a Rottweiler. He is kindly, unassuming. His problem is that he is preventing the appearance of the sort of Church that Shortt would set up if he were in Ratzinger’s shoes. Shortt’s review was written shortly before the English visit of the pope. Reading the review now makes Shortt seem at best petulant, at worst vicious, in many of his judgments. In Shortt’s view, the real problem is that Ratzinger as a young man started out fine. He was ready to bring the Church into the modern world, whatever that world was. Suddenly, after the Council, he seems to have changed. Evidently, it is not permitted to change one’s mind even if one sees that things are not going the right way. I have always assumed that seeing that things are going wrong requires us to change our minds. Otherwise, we ride a rocky course to perdition, if that is where our ideas are going. Shortt has a penchant for psychological explanations. He presents no evidence for his thesis except an anonymous citation from a Tübingen theologian who said that Ratzinger talked more freely with his friends and less comfortably with those who disagreed with him. I cannot imagine a human being in the world for whom this “psychological quirk” is not true. In Shortt’s view, Tracey Rowland’s problem is that, while displaying a careful knowledge of Ratzinger’s works in context, she does not see him as inconsistent. In fact, she shows that the pope was quite consistent. Ratzinger always had an Augustinian orientation that alerted him to the ease with which things could go wrong. Ratzinger’s big sin, evidently, is that he prevented the Church from looking like Shortt would have it. At one point, Shortt finds the Pope’s tone “rebarbative,” that is, repellent. I was struck by the number of sly and demeaning words that appear in this review of the pope. One is tempted to pun: the pope gets “shortt shrift,” the pope is shortt on prudence, shortt on candor, shortt on his understanding of the Church, shortt on his understanding of Vatican II. Alas. Reading between his lines, we know where Shortt stands on gay marriages, dialogue, modernity, and the whole left agenda. Well and good. No wonder he finds the pope’s outlook “somber.” But the pope has pretty well spelled out his outlook in Spe Salvi, the Regensburg Lecture, Deus Caritas Est, and in literally a thousand other places. He knows the world and what it is about. He praises what is worthy of praise. He corrects what is not. This is his job. We do not want a pope telling us everything is grand when it isn’t. But we do want one who understands what is wrong and why it is wrong. This, in short (one “t”), is what we have.